Due to the overwhelming groundswell of support we received at our recent forum (You’re On Your Own Kid) and the industry acknowledgement of the challenges the emerging sector currently faces, Metro Screen’s board has committed to steering Metro Screen into the future as the guardian of this endangered sector. Our financial challenge is to secure the equivalent of $240k in core funding each year to keep the doors open from the end of next year, when our Screen Australia funding finishes. Metro Screen is already a very lean organisation so there is little to trim in our budget and we don’t want to threaten accessibility by increasing our program fees. Our challenge is to identify and source new income. We’re setting up a Working Party with both board and industry representation and we plan to undertake detailed research to explore all avenues. We want to engage our stakeholders to get a holistic view of the emerging landscape. We need to define and map the emerging screen space and its place within the larger screen environment, and drill into where there are skills gaps and future trends. Our aim is to identify sustainable programs to support talent regeneration into the future. It has been incredibly affirming and energising to receive your encouragement and assistance through a variety of channels; the public forum, the Have Your Say feedback and direct calls and conversations. It is particularly heartening that this feedback represents the full diversity of the screen community. Thanks so much for your interest and support, and we’ll keep you posted. It's time to pull that feature draft out from under the bed. Screen West has announced a national call for feature script submissions for the 2014 Feature Navigator Program. Three directors have been selected to work with the writers to develop and potentially produce the selected scripts. Submissions are due 31 Oct 2014. Six documentaries longlisted for the 2014 Walkley Awards for Excellence in Journalism will be screened at the State Library of NSW in Sydney in October, giving the public a free viewing of the finest work in the field over the past year. Screenings are free but you'll need to RSVP. The best of Australian film from last year will be on show at the AACTA Awards Screenings in October. The Screenings are exclusive and complimentary to members of the AFI (open to all) and AACTA (screen professionals), bringing together screen enthusiasts and professionals to discuss and judge films for the AACTA Awards. Screening in Sydney from 14 - 19 Oct, the Antenna Documentary Film Festival promises their most ambitious program yet. Showcasing 35 features from over twenty countries! Antenna offers a rare opportunity to see the best in documentary cinema from the furthest corners of the world. 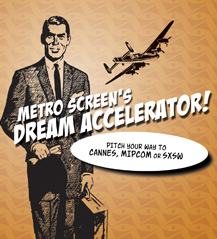 Submit a three minute video pitch for your idea – grab a phone, an iPad or your mate’s camera and sell us your dream concept in our Dream Accelerator! Application deadline Tues 7 October. 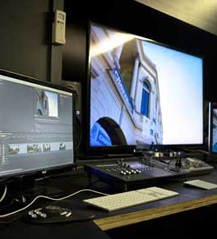 Screen and Media are part of a creative industries boom currently happening in NSW. There is strong growth in video production and specific careers such as Editing, Assistant Directing and Producing. Book early for this free careers information session and open house at Metro Screen where you can meet industry practitioners and hear first hand how they got started. Intermediate Screenwriting starts Wed 15 Oct.
Colour Grading starts Sat 11 Oct.
Sound Design and Editing Course starts Sat 15 Nov. 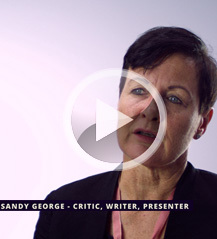 Episode Two of our SCREEN 2030: Extended Interview series features critic, writer, presenter Sandy George. Metro Screen’s Digital Kitchen, funded by Screen NSW, launched the online documentary Screen 2030: Making My Content Pay, at VIVID IDEAS this year asking the big question: What will the screen industry look like in 2030 and will a creative screen career pay the rent? The series further explores the key concepts that resulted from the topic with extended interviews with the experts. With our new client monitor and break-out box we have now completed our 4K workflow! Along with the grunt of our MacPro 2014 (3.0GHz 8-core, 64GB, Dual AMD FirePro D700 GPU 2 x 6GB) and our new Blackmagic UltraStudio 4K , plus a 55" 4K Ultra HD LED LCD TV - Sony Bravia, we are now 4K ready for all your high-end video projects. Work with Roar's creatives to identify, budget and develop new projects, identify cross-media opportunities and to lead social media strategy for the company and its products. Roar’s work covers factual television, apps, web, games, theatre and digital visitor experience installations. Seeking someone with entrepreneurial flair who would benefit from being part of an established production company. Read more.